Guerrero means "warrior" in Spanish. There are three Guerreros on the Texas/ Mexico border - all of them on the Mexican side. There is a Guerra in Jim Hogg County - but that's another story. The other two Guerreros are in the State of Tamaulipas: Guerrero Viejo was flooded when the Falcon Reservoir was formed in the 1950s and the new Ciudad Guerrero remains not far from its namesake. The Guerrero we're visiting here dates to Spanish rule and among other things - was the point where Santa Anna's army crossed the Rio Grande in 1836. Guerrero was once a very busy crossing point until smugglers moved about 30 miles upriver to avoid involving government in their business. Guerrero is only about 30 miles from Piedras Negras and is certainly worth the trip if you're in the area and don't mind the absence of nightlife. From downtown Piedras Negras - follow the signs that say Highway 57 (To Saltillo). 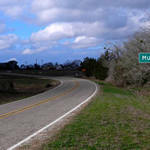 As the town thins out you'll come to a major intersection where you'll see the directional sign to Nuevo Laredo (Hwy 2). After passing scores of ranches on a smooth 30-mile trip road you'll arrive at Guerrero. Guerrero is spacious with well-paved streets. The feeling of spaciousness is perhaps due to the removal (or collapse) of some buildings - but the wells remain in place - many of them on vacant lots. Many buildings and some crypts in the cemetery show that Guerrero dates to the 1700s. The town square consists of the two story municipal building/city hall on the south side and a church to the east. A bandstand is the centerpiece and a primary school is on the NW corner. A casual restaurant sits north of the church. 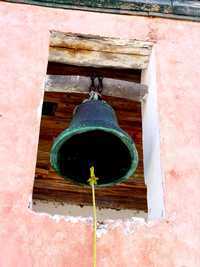 The bell tower of the church contains two bells - the smaller of which has a large noticeable crack. The larger bell is rung by means of a screaming yellow plastic rope. 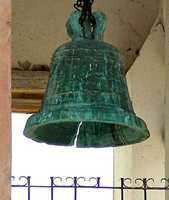 Rather than confine the bell ringer to inside the tower - he rings the bell from the outside. This practice is wearing a groove into the masonry - but it doesn't seem to bother anyone enough to abandon the practice. Traffic is so rare that housewives actually sweep the street in front of their houses with their household brooms. Kids in the street may be actual kids - since many househods keep goats. During our visit a woman stopped in the middle of the street to deliver a cake to the primary school - leaving her car door open for the ten minutes she was inside. Two things give Guerrero a distinctive color - one is their trademark type of well - an arch over a rustic natural crosspiece from which the pulley is hung - and a decorative strip of paint waist-high on all of the houses and stores. Within the decorative strip the pattern may vary but it's always the same height. The wells (we are told) reach the water table 1500 feet below the surface. When you were down in Eagle Pass did you cross the border and go to Guerrero, about 25 miles down river from Piedras Negras, to visit the mission San Juan Baptista?